The man played a round of golf with McIlroy while he was an unknown kid at Holywood golf club near Belfast, and was so amazed by the teenager's talent that he immediately went to the bookies to bet that the lad would one day win a Major championship. The gambler - who has remained anonymous since his windfall - placed £50 at odds of 500-1 that McIlroy would win one of golf's top four titles before the age of 25. 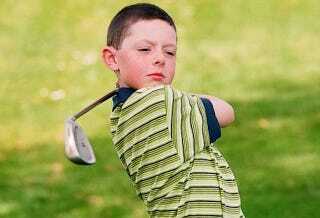 McIlroy duly obliged by romping home at Congressional this weekend aged just 22 years and one month. McIlroy also stands to earn his father a small windfall if he wins The Open Championship next month: seven years ago, Gerry McIlroy and three friends each bet £100 each at 500-1 odds that the 15-year-old Rory would win at The Open before he turned 25. He has three attempts ahead of him, which would earn Gerry a quarter share of about £200,000. Every parent should have so much faith in their child, right? Or at least in the latest prodigy at the local golf club. What's $50 to a child's crippling sense of parental pressure and fortune?